I awoke to find myself curled up on the floor, lights shining in my eyes, the underside of a porcelain throne as my bedmate. I was sleeping in a public toilet. A crapper. A john. It ran through my head that I could do something with this experience if I happened to be a country western song writer. But, where is the romance? I hadn't been sitting in a bar, drinking off the loss of some man who'd done me wrong. I hadn't even been in a bar drinking what is supposed to be a horrible Newfoundland Rum called Screech, kissing a very old cod. At least with that I'd have been dubbed an honorary Newfoundlander. Do they write songs about 55 year old women who head off with a Newfoundland Dog in a Subaru to photograph and write? Better an old musician with a pick-up truck, a beat up guitar and a hound dog, I suspect. But then, you need to be in jail, not a campground. So, has the the journey hit an all-time low when waking to the sight of a crapper in a public john? Our life on the road was taking on a rhythm. Drive, photograph, camp, get wet, spend a day drying out, then start over again. You can increase the tent flooding experience by tossing in a 100 pound dog that likes to sleep on her back, leaning against the backside of the tent. Count on a pool of at least 4" of water in her corner following a few hours of that. Even without her help, I was waking up many mornings to a wet pillow and sleeping bag. 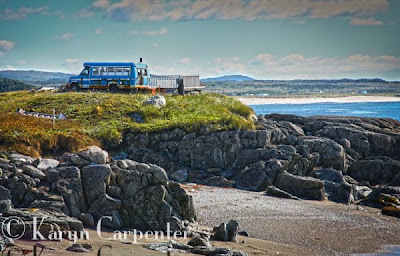 Arayo and I had spent the day driving my favorite piece of Newfoundland. A stretch of road along the southwest shore. The clouds were building and forecasters were predicting 3 or more days of rain. I looked at the forecast for Nova Scotia and decided that God was giving me a nudge to help me leave the island. I called to book a ferry which a few hours ago had plenty of space available. Apparently God was speaking to a few others as well, and they were faster to pick up on the message. The ferry was booked. I'd have to do one more night in rainy Newfoundland. By this time rain was beating down on the rock. I spoke with the guys at the Provincial Park and mentioned that half my campsite was already under water. " Perhaps I should move?" "We were just talking about you and thought it was time to move you," the ranger said, explaining that the dry creek behind my tent tended to fill quickly and the road in front of it could accumulate 6" or so of rain. He offered to throw on some rain gear and come help. I tossed on two extremely heavy jackets. Within 10 minutes we'd moved the tent but I was soaked to the bone. I was pondering to myself if I could get away with sneaking into the ladies bathroom and just hanging out there for the night. Apparently brilliant minds - or those in survival mode - tend to think alike. "Why don't you do this. We've got a handicapped toilet. No one staying here is going to need it, so you take your sleeping bag in there, lock the door and no one will bother you." BLESS his heart! Fact is, other than one other couple in an rv, I was the only person in the campsite, period. Certainly the only one crazy enough to sleep in a tent in something like this. So, while the lights continued to shine in our eyes, a rattling fan hummed and the rain beat down outside. Arayo and I were snug and dry. Though, in a slightly unorthodox sleeping locale at least it would make for a good story to tell. 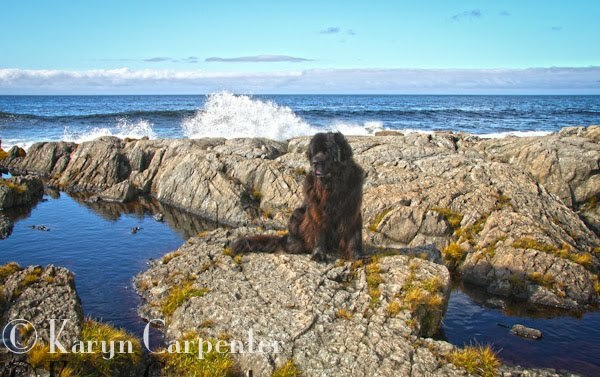 Photos: After the rain, Arayo is forced to endure one more Newfoundland photo shoot at Cape Ray. And, summer cottages in Newfoundland are often simple but functional and dry. Someone built theirs out of an old bus and built a viewing deck off the back side!